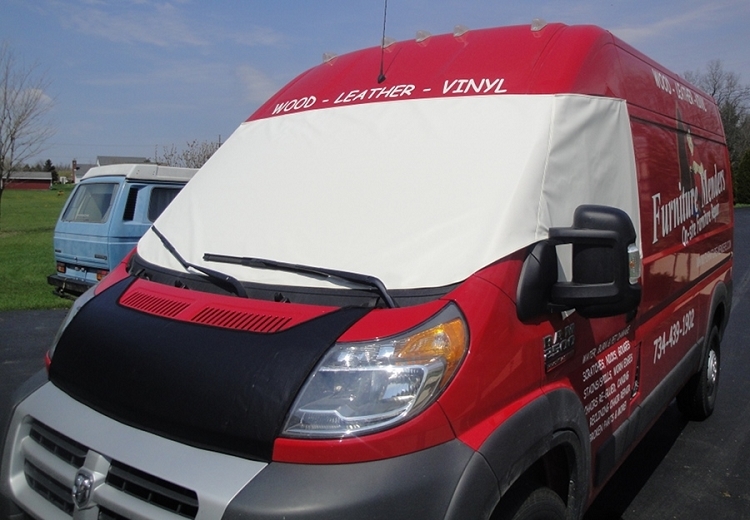 Our 1 piece Dodge ProMaster Cab Window Covers aren't the same cheap vinyl covers as found elsewhere. Ours are made from Aqualon, a marine grade coated 2-ply polyester duck material that won't crack, peel or harden. Provides complete privacy for cab windows. Choose white, beige or gray color. To install, slip the corners over the upper edge of door and close door. Cover is held in place by doors and sewn in magnets. Fits Dodge Ram ProMaster with chassis years 2014 - 2019. Rolls up or folds for easy storage. Storage bag included. Made In USA. Made to order. Usually ships in 1-2 weeks. Please allow 1-5 additional business days for delivery. Ships only by US Mail. Please provide a delivery address that accepts US Mail delivery. Very well made, and fits my Winnebago Travato without any problems. Takes up a lot less space than the included inside covers. Goes on and off without much trouble. I seldom write reviews but I am happy to do so for the windshield cover I purchased from EuroCampers. At the time I ordered it, the cheaper options on other websites were not available for my 2016 Promaster. Those cheaper options may be available now but you should still consider the EuroCampers version because it is high quality, it fits like a kid glove and it's is super easy to install and put away. I think, because of the quality of the fabric, it is going to last a long time. To me, it is worth the price. I'm over 65, short and a tad overweight yet I can put the cover on in less than 5 minutes. That means a lot to me. Just wanted to tell you how pleased we are with your windshield cover and the speedy delivery. We will recommend you! Fits great! I use it for storage and on the road. I have foil covered bubble wrap underneath to keep the heat out of the van while in storage. Purchased to cover the front cab windows for my 2017 Winnebago Trend motorhome. The cover is easy to install over windows and is water proof. The fit is slightly loose but still covers. I use when camping for more than two days instead of using the supplied inside window covers. It would be better if it was insulated from outside heat (95*F).